Our knowledge of the heart beat has its origins in early civilizations of Europe, Asia, and North Africa, which considered the heart to be the centre of cognitive faculties. In 1356 a clear illustration of a physician taking a patient’s pulse was depicted in Aldebrande de Florence’s illustrated manuscript. Despite gradual progress in instrumentation over the centuries and the development of modern cardiology, the heart has remained in popular culture the seat of life and emotion. Heart rate (HR) has become an important, informative and accessible clinical variable1. This cardionote refers to an article by Vukadinović A et al who explored HR responses in healthy individuals and in a variety of clinical conditions. The authors also reviewed the relationship between higher HR and clinical outcomes (i.e. HR as a cause or risk marker) and the potential benefit of reducing HR to improve prognosis2. Age and gender constitute intrinsic factors that modulate HR responses and which cannot be modified. Physical, physiological and psychological variables as well as sympathetic and vagal activity influence the HR. Table 1 displays some of the variables that affect HR. Epidemiological and clinical studies have shown that resting heart rate is also determined by numerous non-modifiable factors3. The article deals with the impact of HR along the ‘cardiovascular continuum’, starting with healthy subjects, and subsequently considering the development of atherosclerosis and its consequences. In the early stages of disease, cardiovascular risk factors trigger endothelial dysfunction, oxidative stress and contribute to plaque formation. Although a higher heart rate is a well defined risk marker of clinical outcomes in this setting, HR reduction to below the ‘risk threshold’ (around 75bpm) has no impact on prognosis. However, beneficial effects of HR lowering have been seen in heart failure (HF) without ventricular dysfunction. With this analysis, the article separates those conditions where HR is a non-modifiable risk marker from the ones that derive a favorable long-term if HR is reduced (modifiable risk factor). There is consistency regarding the role of HR as a modifiable risk factor in HF, specially HF with ventricular dysfunction and sinus rhythm. 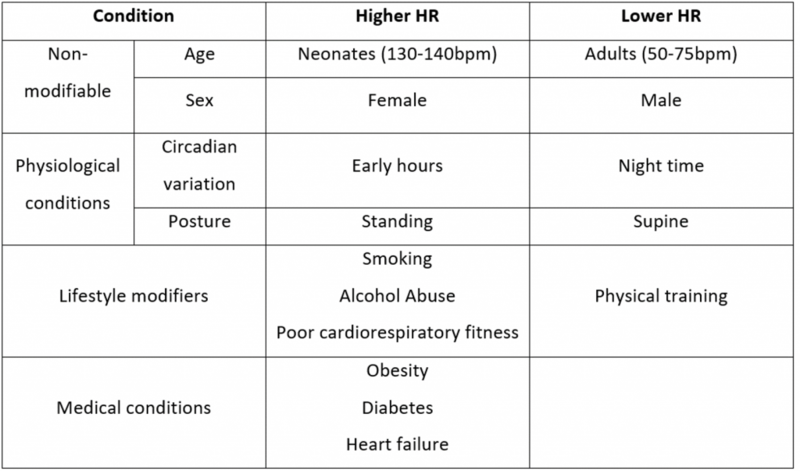 In fact, HR is included in nearly every HF risk score4,5. It is highly predictive of progression from paroxysmal to persistent atrial fibrillation and of long-term recovery of left ventricle systolic function in patients with tachycardia-mediated cardiomyopathy (due to atrial fibrillation). Sympathetic stimulation manifests as elevated resting HR, reduced HR variability, peak exercise HR, and prolonged HR recovery following exercise testing6-8. Since sympathetic overdrive is present in many comorbidities, the article explores the roles of HR reduction (with ivabradine or other HR-lowering agents) in a variety of situations and/or HF-comorbidities2. These situations have been shown to have an important role in recent years and are discussed in the current HF guidelines9. Vukadinović et al focus on: atrial fibrillation, low blood pressure, diabetes mellitus, the elderly, left bundle branch block, septic shock, cerebrovascular disease, renal disease, erectile dysfunction and pulmonary disease, non-adherence to evidence-based medications and cancer. Perhaps the only situation that is not referenced in the article is HF with paced rhythm. Sequential randomized trials have not been performed in this group of patients, but existing data are conflicting, with some data showing improvement in exercise tolerance with an increased pacing rate10,11. Alternatively, Thackray showed a deleterious effect of increasing the pacing rate from 60 to 80 bpm in patients with HF and preserved ejection fraction treated with beta blockers12. Vukadinović A et al remark the significance of HR as a powerful clinical predictor in addition to being a valuable vital sign used for patient assessment to estimate risk and to guide therapy in several conditions. However, HR control has only become a therapeutic target for patients in sinus rhythm and HF with left ventricular dysfunction. Optimal treatment strategies for patients without cardiovascular disease and non-cardiovascular conditions are less clear, outlining a need for further data. 2.-Vukadinović A, Vukadinović D, Borer J, Cowie M, Komajda M, Lainscak M, Swedberg K, Böhm M. Heart rate and its reduction in chronic heart failure and beyond. Eur J Heart Fail. 2017 [Epub ahead of print] doi: 10.1002/ejhf.902. 4.-Ford I, Robertson M, Komajda M, et al. Top ten risk factors for morbidity and mortality in patients with chronic systolic heart failure and elevated heart rate: The SHIFT Risk Model. Int J Cardiol 2015; 184:163-169. 5.-Alvarez-Garc ıa J, Ferrero-Gregori A, Puig T, et al. A simple validated method for predicting the risk of hospitalization for worsening of heart failure in ambulatory patients: The Redin-SCORE. Eur J Heart Fail 2015; 17:818-827. 6.-Kato Y, Suzuki S, Kano H, et al. Prognostic significance of exercise capacity and resting heart rate: comparison between atrial fibrillation and sinus rhythm. Int J Cardiol 2016; 203:561-563. 7.-Verbrugge FH, Vrijsen J, Vercammen J, et al. Heart rate reduction and exercise & performance in recent onset heart failure with reduced ejection fraction: Arguments for beta-blocker hypo-response. Acta Cardiol 2015; 70: 565-572.
patients with heart failure. Anadolu Kardiyoloji Dergisi 2015; 15:727 – 734. 10.-Ghotbi AA, Sander M, Køber L, et al. Optimal cardiac resynchronization therapy pacing rate in nonischemic heart failure patients: a randomized crossover pilot trial. PLoS ONE 2015; 10:e0138124. 12.-Thackray SD, Ghosh JM, Wright GA, et al. 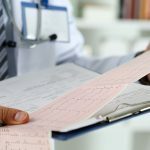 The effect of altering heart rate on ventricular function in patients with heart failure treated with beta-blockers. Am Heart J 2006; 152:713; e9-13.